Several areas of Shimla remained without power supply for the fourth day. SHIMLA: The piercing cold wave sweeping most parts of Himachal Pradesh further aggravated today as tribal areas and other higher hills virtually froze with minimum temperatures plummeting and staying between minus 13 and minus 18 degree Celsius. The tribal areas and upper areas of Shimla, Kullu and Sirmaur districts remained cut off from rest of the state for the fourth day today while vehicular traffic was badly disrupted due to slippery road conditions. 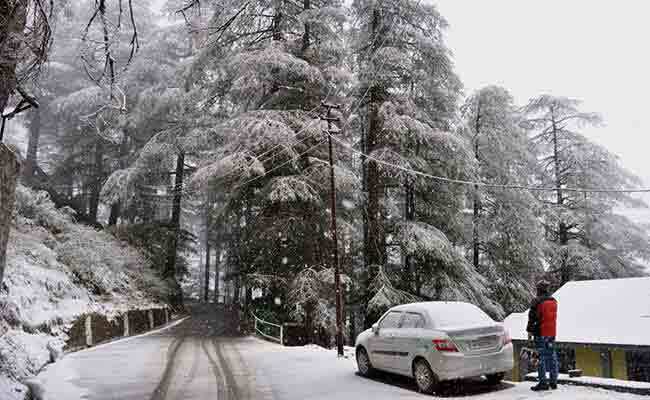 Barring Manali which received 4 cm of fresh snow, the weather remained dry in the region. Keylong in tribal Lahaul and Spiti experienced the coldest night with mercury dropping by nine degree to stay minus 12 degree Celsius while the Kalpa in adjoining Kinnaur district groaned under arctic conditions with mercury slipping to minus 7.6 degree Celsius. The water pipes froze and burst at several paces in higher hills affecting water supply while, key hill resorts of Manali and Shimla shivered at minimum temperatures at minus 2 degree an minus 0.8 degree Celsius while Bhuntar, Solan and Sundernagar recorded a low of 0.1 degree, 1 degree and 1.5 degree Celsius. Several areas of Shimla remained without power supply for the fourth day while water supply was restored in half dozen localities as total pumping was only 16 MLD against normal pumping of 34 to 36 MLD. A sum of Rs. 25 crore was released for restoration of roads, electricity and water in heavy snow affected areas after Chief Minister Virbhadra Sigh reviewed the condition of roads, electricity, and water and essential commodities in the areas affected by heavy snow fall at a high level meeting. Singh laid special stress on restoration works in Shimla and said that Shimla being the capital, it was face of the state and there should be better preparedness to meet such eventualities. Singh also ordered an inquiry into reported death of a child in incubator in KNH (Kamla Nehru Hospital) during power breakdown and directed that all the faulty generators in hospitals in Shimla should be immediately repaired or replaced. Out of 565 roads closed due to snow, 208 had been opened and 394 roads including 194 in Shimla and 63 in Kullu district remained to be opened and 14,000 are working day and night on restoration works, sources said. Similarly out of 700 water supply and irrigation schemes, 248 schemes had been restored, they claimed.